This is the latest version of VW's tandem L1 project, so-called because of its ability to travel 100km on one litre of fuel. 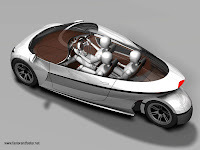 The two-seater was due to be unveiled at the Frankfurt motor show on Tuesday, but early pictures and details were revealed by the German media over the weekend. 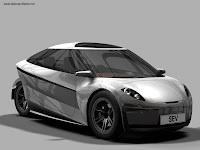 The reports suggest the car, which is powered by a 29bhp two-cylinder diesel linked to a seven-speed DSG gearbox and weighs around 380kg, will achieve 189.6mpg. VW originally showed a one-litre concept in 2002, although the exotic lightweight materials used to build it made it to expensive to consider for production. Wow that's a funky lookin' car. Nice rimz, are they dubz? Oh look : a GM EV-1 ! VW _could_ have been a bit more individualistic on that one. [quote Autocar]This is the latest version of VW's tandem L1 project, so-called because of its ability to travel 100km on one litre of fuel. Well, err, 189 mpg is only 67 km per litre. Doh!! "This is the latest version of VW's tandem L1 project, so-called because of the project's ultimate ambition to travel 100km on one litre of fuel."